It sounds like science fiction medicine. Imagine a harmless solution or gas containing sub-atomic particles manipulated by quantum technology that when injected or inhaled would “light up” your molecular insides, so they could be scanned at a detail hundreds of times that of the strongest MRI machine? It could lead to faster, cheaper and more accurate diagnosis of certain tumours, for example, at a molecular level. But this isn’t science fiction – it is theoretically possible and a group of quantum physicists have now shown how it can be done by using light shone through incredibly thin layers of synthetic diamond crystals containing quantum probes. 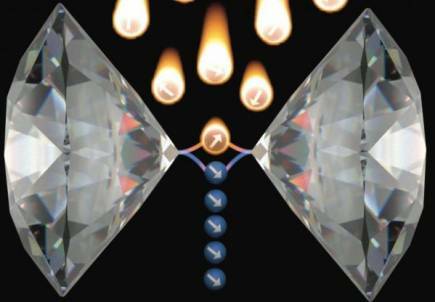 In results published in Nature Communications, the quantum physicists were able to use the light shone through a diamond layer 100 microns thick to change the magnetic spin of nuclei (the particles at the heart of atoms) within molecules on the diamond surface so that they “hyperpolarise” or line up in the same way. 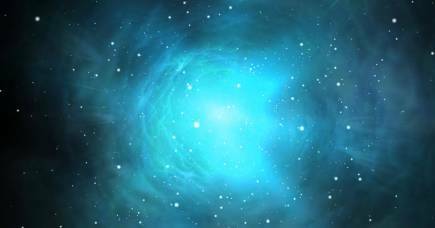 By doing so, the different nuclei produce a stronger magnetic field among themselves. If a solution or gas containing bio-molecules quantum mechanically adjusted like this were to be injected, it would temporarily generate stronger magnetic fields at corresponding locations in the body. “One of the applications is that it could allow us to improve the production of molecular contrast agents that target certain parts of the body and “light” up magnetically, significantly increasing the amount of detail that can be picked up by an MRI scan,” says University of Melbourne post-doctoral research physicist Dr Liam Hall. Research team leader Professor Lloyd Hollenberg, the University of Melbourne’s Thomas Baker Chair of physics, says their quantum technology approach to hyperpolarisation is relatively simple in terms of the equipment involved, and has the potential to produce clinically relevant amounts of contrast agents at very high polarisation level. Typical “brute force” approaches to hyperpolarisation of the nuclear spins in contrast agent molecules involve placing the sample in very high magnetic fields at very low temperatures – the higher the field, the more spins line up. At room temperature in an MRI machine at the largest magnetic fields considered safe, the level of polarisation is extremely low – perhaps 1 spin per million – and dictates the resolution limit of MRI. “In our experiment, we achieved a polarisation level of around 50 per cent for polymer molecules on the diamond surface – this is the first time it has been achieved using the diamond-based quantum technology,” says Professor Hollenberg. 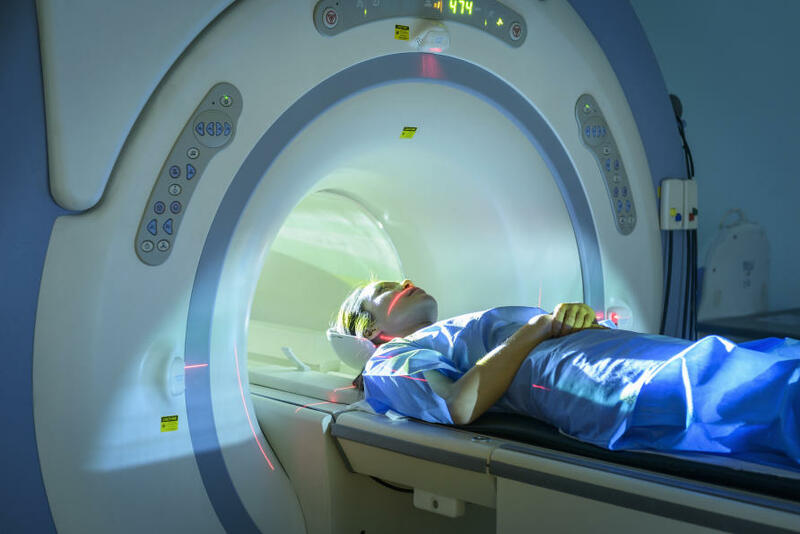 While other techniques for hyperpolarisation do exist, Professor Hollenberg says the required infrastructure can rival the cost of the MRI machine itself. Indeed, team member and PhD student David Broadway said their technique “achieves excellent results using fridge magnets and some atomic-level quantum mechanics”. 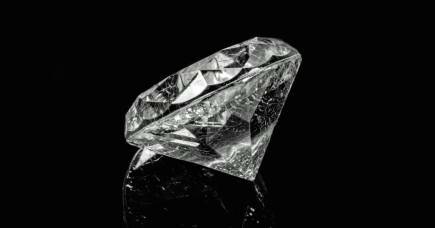 That bit of quantum mechanics refers to the remarkable quantum properties of a naturally occurring defect in the lattice of diamond crystals known as the nitrogen-vacancy centre (NV). What makes the NV defect special is that the spin of electrons inside the defect are quantum mechanical and can be lined up, or polarised, by illuminating it with a green laser. “We optimise how the polarised NV centre talks to, and effectively transfers its spin state to, the nuclear spins of molecules outside the diamond to line them up. “In a sense, the quantum probe extracts random spin disorder from the (“hot”) target molecules to produce a (“cold”) spin-aligned state,” says Dr. Hall, who came up with the theoretical concept. Dr Hall says this quantum mechanical transfer, which was demonstrated using a single quantum NV defect, could be used for solutions of bio-molecules passed over a green-lit diamond sheet containing many of these NV systems. “Because we don’t modify the contrast agents beyond the polarisation of their nuclear spins, this process doesn’t affect the biology or the physiology of a person in any way,” says Dr Hall. The key challenge now is for the researchers to scale-up the “quantum hyperpolarisation” system to create sufficient volumes of contrasting agent molecules without the hyperpolarising quantum NV probes being too closely packed and disrupting each other. “If we can tick that box, we can then think about polarising volumes of MRI contrast agents to a high level for use in MRI scanners found in research labs and hospitals,” says Professor Hollenberg. The other members of the research team are Dr Jean-Philippe Tetienne, Dr David Simpson, Dr Alastair Stacey, and PhD candidate James Wood.